Pishevar & Associates believes wholeheartedly in community activity, volunteerism, good works and legal services for public interest causes. We voluntarily and regularly take on pro bono and reduced fee cases that are referred to us by the Montgomery County Public Defender's Office and the Montgomery County Bar Association in Rockville, Maryland. We have regularly averaged handling over 20 such cases for the indigent per year. Mr. Pishevar also has participated extensively in Habitat For Humanity (the building of a House in Rockville, Maryland). Mr. Pishevar also runs in and sponsor's a Team for the Susan G. Komen National Race for the Cure for Breast Cancer Research. 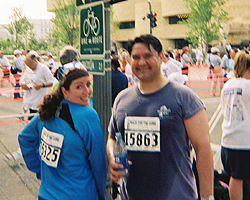 You may join The Pishevar Team and Run in the next 5k race by clicking here. Mr Pishevar has also volunteered with Serve DC to help assist with Hurricane Katrina victims fromNew Orleans. --Association of Trial Lawyers of America (ATLA) Congressional Key Person Committee - 6/22/06: A.P. Pishevar is honored to accept an appointed to the ATLA Key Person Committee. The mission of this committee is to work with the U.S. Congress and to keep key congressional legislators informed of the status of legislation. A.P. will participate in committee activities and presentations and attend a number of conferences and conventions throughout the United States. --KATRINA-- dateline September 1, 2005: The streets of New Orleans are still covered with floodwaters and dead bodies seen floating on the river in Mississippi. A massive evacuation is required but has been stalled by gunshots fired upon a rescue helicopter. New Orleans is in Chaos. An air of helpless desperation is peppered with gunfire crackling throughout the city of New Orleans. Mayor Ray Nagin has said that there is a significant number of dead bodies in the water and there are dead people in attics. One of my family members was rescued by boat from her attic yesterday. She had been asked to stay behind because she is a medical professional. Thousands have lost their lives to Hurricane Katrina in New Orleans and the Gulf Coast Region. More may die as deadly illnesses brew around survivors in the infested waters that now fill their beloved streets. Homes lost, no shelter, weary from the storm there seems to be no relief in sight. Is there any hope for a warm meal, shower and a place to recover from the tragedy? Online message boards like Craigslist.org and Nola.com are flooded with offers from citizens to hurricane victims to use their bedrooms in their homes, vacation homes, buildings, jobs and money, it's clear that so many people across the U.S. are ready and willing to help their neighbors in need. It's a grass roots effort in the making. This is a true disaster that tugs at your heart. Sadly as we have seen so many times in the past these kind souls could become prey to scam artists who lurk in the shadows looking for opportunities to exploit. These scammers can sound charming on the phone, provide references (who are really their accomplice in the next state), and can even show up at the door with plenty of legitimate looking i.d. that is nothing but fake. They may stop at nothing to appear as legitimate victims only to take advantage of a well meaning family. To see for yourself just do one internet Google search using the terms "hurricane" and "scam" and the result will be plenty of links and reminders of how kind people have been taken advantage of by a select few who look upon tragedy as a means to implement a crime. One solution is that it is imperative, that if you know anyone, a local or state politician, influential business owner or better yet state or national figures and organizations you should contact them, including the American Red Cross, FEMA and other legitimate organizations, that can spearhead putting together an organized plan, a website etc. to match families who want to provide housing and shelter. Perhaps initially, people can be bussed to a local government owned building where local officials and volunteers can match host families. Housing agreements need to be drawn up on the spot and signed and liability issues addressed. This is not to be cynical or harsh. After all, it's sad that we have to think this way. There is an IMMEDIATE need for organized housing and now is the time that you can call your contacts and get something going that is organized will benefit everyone. Open your hearts, your pocket books and your doors, but protect yourself and be smart. Hope for the best but prepare for the worst. I do want to share with you that my sister, Sarah and her husband Alvin are now housing 15 refugees who were forced to evacuate their homes in New Orleans . This family has lost their history and everything they owned. Now they are facing the reality of saying goodbye to their past, trying to adapt to a new city, finding new jobs, clothes and a place of their own in a city they never dreamed they would be in even a week ago. As they say, just when we think we are in "control," nature shows us how small and alone we really are in the vast Universe. We humans only have each other. Looking at the damage from Katrina left behind; it is fair to say the survivors were the lucky ones. It is heart breaking to see our fellow human beings with no relief from the hot sun, no place to lay their weary heads, no food or shelter. Judging from the 500-foot gap in the failed floodwall, its safe to say that the levees ofLake Pontchartrainwere not built or properly maintained to withstand the pressure brought to bare by Hurricane Katrina. Moreover, once they evacuate the many tens of thousands of people there is no plan in place to house and feed these refugees. Children were left to hold up a giant sign that said: "Help us!" Will we answer their plea? As the death toll rises, many of us are left wondering what we can do to help. There are numerous reports of scammers already attempting to take advantage of this catastrophic even by defrauding well intentioned good samaritans. The safest bet so far is to help by donating to the Red Cross and legitimate Federal Emergency Agencies. First and foremost you can donate money. Another great way help is to temporarily offer any empty premises, vacation homes or the like as shelters to families in need. If you can lend a hand to your brothers and sisters in need, this is a time of action for all of us. Thanks to all those who have helped in this time of need and have worked to redeem our selves from this tragedy and transform it into our finest hour.